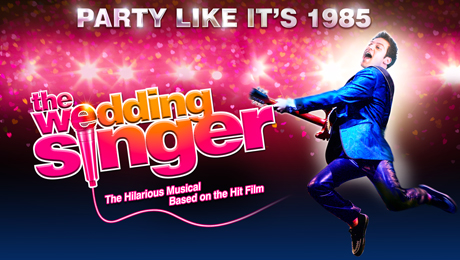 Based on the hit movie, this hilarious 80’s musical is coming to the kings Theatre Glasgow in April 2017! He’s the life of the party until his fiancé, Linda, leaves him at the altar. Shot through the heart, Robbie makes every wedding as disastrous as his own. When he meets Julia, an admiring young waitress, Robbie falls madly in love. Only trouble is Julia is about to be married to a Wall Street shark, and unless Robbie can pull off the performance of a decade, the girl of his dreams will be gone forever. With a score that pays loving homage to the pop songs of the 1980s, The Wedding Singer takes us back to a time when hair was big, greed was good, collars were up, and a wedding singer might just be the coolest guy in the room. Jon Robyns (Avenue Q, Legally Blonde) as Robbie Hart, Cassie Compton (X Factor) as Julia and Roxanne Pallett (Emmerdale, Waterloo Road) as her best friend Holly, Ray Quinn (X Factor, Dancing On Ice) as bad boy Glenn and Ruth Madoc (Hi-De-Hi!, Little Britain) as Grandma Rosie.